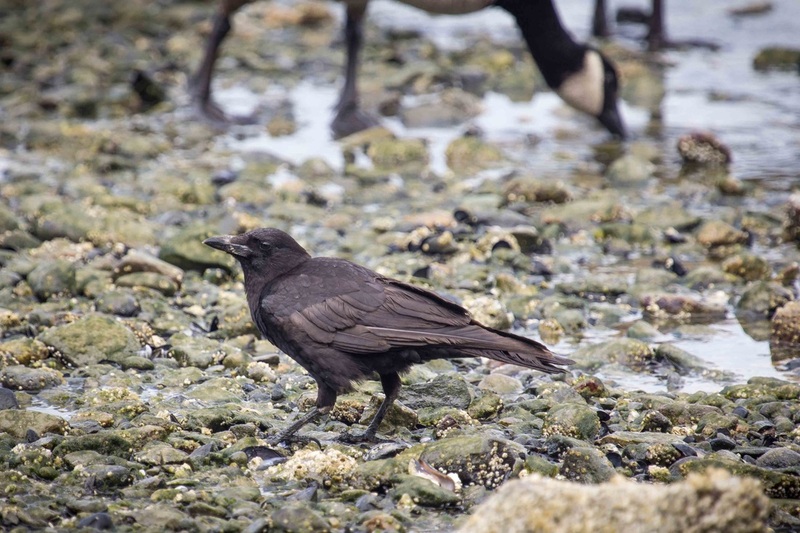 Northwestern crow foraging in the rocky intertidal. Photo by Josh Silberg. 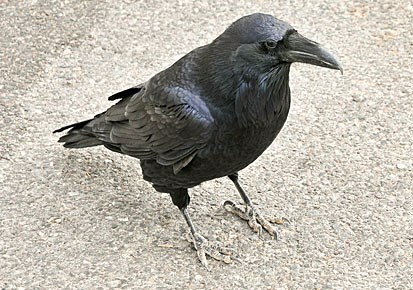 This small crow is all black with a solid, stout beak, glossy feathers, and a rounded tail. Juveniles are fluffier and don't have glossy head feathers. It makes a harsh, nasal 'caw' sound. 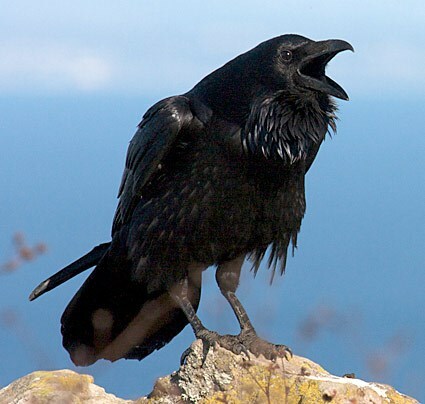 The northwestern crow is found along the Pacific Northwest coast from northern Washington State to Alaska. It is commonly seen scavenging along shorelines and river deltas, as well as more urban areas, campgrounds, and parks. It is not usually found deep in forested areas. The common raven (Corvus corax) is larger than the northwestern crow, although this can be difficult to judge without a size comparison. Its beak is noticeably larger, its tail feathers are longer, and its throat feathers are shaggy. 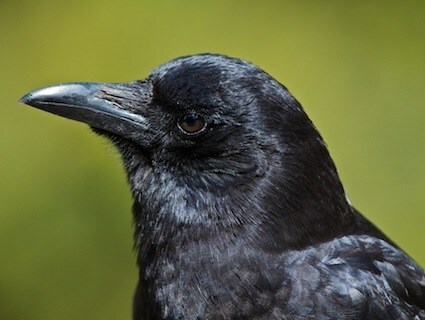 The American crow (Corvus brachyrhynchos), which is almost identical to the northwestern crow, is not found along the BC coast; some believe the northwestern and American crows may actually belong to the same species. In winter northwestern crows roost in flocks. Where each crow roosts is based on a complex hierarchy. Northwestern crow. The Birds of North America Online (A. Poole, Ed.). Ithaca: Cornell Lab of Ornithology; Retrieved from the Birds of North America Online. Accessed 17/08/2013. Northwestern crow Corvus caurinus. Audubon Birds. National Audubon Society. Accessed 17/08/2015. Dunn, J. L. and Alderfer, J. (Eds.). (2011). National Geographic Field Guide to the Birds of North America. (6th Ed.). Washington, D.C.: National Geographic Society. Pp. 362-363.